Every state in the US produces wine. Why not taste them? 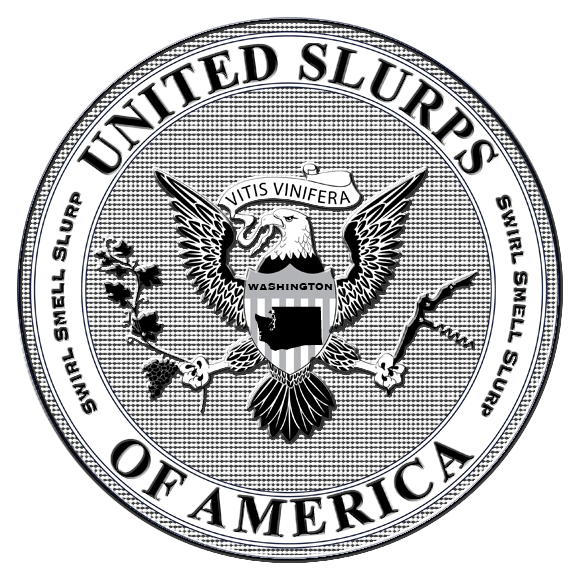 For 50 weeks We will do just that…welcome to the United Slurps of America. We find it extremely apropos that the motto for this week’s featured state is “Alki.” Yes, the state of Washington likes it’s alcohol, especially wine. Okay, okay…”Alki” is Chinook for “by and by” but it is still appropriate; only in the last fifty years or so has Washington been producing serious wine, but the future of the state’s wine industry appears limitless. According to our guest blogger Josh Wade, of the terrific blog DRINKnectar.com, “before long” the wines from Washington will be tantalizing all wine lover’s palates. She said: Purpley ruby, translucent around the edges. Smells like a cherry Coke burnt over a cedar campfire. With tobacco leaves thrown in. I’m guessing there is some American oak involved. Not much flavor up front on the palate, but the finish is forever and velvety…too bad the muddy flavors and harsh bite get in the way. Some cocoa and stewed plums, but mostly tastes like a goopy, dark mess with over ripe tannin and weak structure. He said: Not as dark as a typical Merlot. Dark fruit and an underlying funk on the nose. And some chocolate. What is that funk? It kinda smells like a meat product cooking on a campfire, not exactly a hot dog, but close. There is some funk in the mouth too. That scent I can’t really pinpoint keeps showing up. The flavors are intitally pretty weak, but there is a nice choco-cherry cola showing up. I just took a 10 minute break. Air helps this wine. The funk is mostly gone (or I’m used to it) and it’s drinking nicely. There are flavors and textures of that Bottle cap candy. I’m really starting to like it. I think I don’t dislike it as much as Her or like it as much as DN; I’m right in the middle. I will finish the bottle. DRINKnectar said: Let me just start by saying Merlot is making a comeback in a big way. Don’t forget to participate in #WAMerlot on March 25! Mildly translucent with ruby red undertones. I started to get a whiff of the wine when I was pouring. Immediately hit by dark chocolate and oaky cherries. I would imagine this would be the aroma an Umpa Lumpa would smell in the chocolate river (if cherries were involved too). The sip is slightly thin on the front that opens up to a nice moderate fruit – still cherries. Definitely a chocolate covered cherry Merlot. The name is apropos in that the finish is very smooth. I think the devil is in the fact that the temptation is strong to finish the whole thing. The devil won. Think Elvis in a velvet leisure suit suckin’ on a chocolate covered cherry! Thank you, thank you very much! She said: Pretty, pale straw yellow color. The wine smells like Hawaii on a spring morning: very floral and ripe. Also there is an undertone of petrol which can be quite attractive in Riesling. In the mouth it tastes like creamy lime yogurt and lychee syrup. There is plenty of acid and minerality which prevents the wine from being too cloying, but the sweetness and viscosity points to residual sugar. The finish is long and dry with lingering tropical fruit flavors. I wish it was more aggressive, but this is fine, easy drinking wine–not exceptional, but enjoyable. In fact, We enjoyed it with spicy fresh fish tacos that had lots of lime, jalapeno and cilantro–the wine mellowed the heat and made for a great pairing. He said: Very pale with a watery perimeter. Citrus on the nose and a little apricot and a granny smith apple. In the mouth it’s candy. It’s sweet and a little unbalanced, there is a hole in the middle..and quite a short aftertaste. It makes me pucker a bit, like having a sweet-tart. To me this wine is sweet in 2 ways; both sugary and it’s a little too friendly. All that being said, it is refreshing and I will finish this bottle too (it may be a long night). Not great, but totally drinkable. DRINKnectar said: Bright pale honey color. Viscosity seemed pretty thick on the swirl. I must start by saying I’m not a sweet wine fan, the swirl and the sniff had me thinking syrup was on the other end. The aroma was a nice citrus lime with good white plumeria undertones. Hesitantly I took the sip and was pleasantly surprised by the balance. Not an overly sweet Riesling (6 on a 10 pt scale) but had enough acidity to make it pleasing. Good tropical fruit flavors without a typical steeliness that comes with cheaper models. Not MY fave, but those who like sweet over dry would go gaga, (not Lady). Washington is making some killer Rieslings under $15 and while this doesn’t make my killer list, it’s a good solid effort. 2 down, 48 to go. She said: I’m regretting We didn’t pick more standout wines for the WA edition of USA. I’ve really enjoyed the state’s offerings in the past, especially from DeLille Cellars, Chateau Ste. Michelle, L’Ecole No. 41, Woodward Canyon, and Andrew Will. These makers have consistently impressed me. Then again, there is a pretty large price point difference between most of what these wineries produce and the $11.99 (from K&L Wine Merchants, Hollywood) bottles We chose for the tasting. Luckily, We bought three others. He said: I have had some really good wine from Washington. And, oh boy, have I had a bad one. I still have nightmares about that bottle of Hogue. But for the most part, I have enjoyed Washington wine, and plan to continue doing so. We said: First off: it was a genuine treat to have Josh as our virtual tasting companion. He is a social networking genius (don’t take our word for it, follow him on Twitter and Facebook) and the most enthusiastic cheerleader for Washington wines (and coffee) that we’ve come across. Be sure to join him and hundreds of other wine tasters for the WAMerlot Twitter Tasting on March 25. And an aside, these wineries as well as many others we have reviewed do not provide bottle shots or logos (vector, pretty please) on their websites. Please reconsider and you will find our blog filled with images of your bottle and vector logos of your company with oh so crisp and clean lines. And, really, He has been working on a presentation for a lecture at SCI-Arc tomorrow and doesn’t have time to search the web or for Us to create them. Noted? Also, we love you. And. She appreciates the convenience of screwcaps, and He (ever the traditionalist, despite himself) is warming up to them. Nice job again, guys. Really looking forward to reading about wine in some of the more “obscure” wine producing states. I am dying to try a bottle of Woodward Canyon. The winemaker seems like a total nut. Right up my alley. Which wines of his have you had before? Excellent work and thanks for letting me participate. I think we were limited in our distribution reach for some “really good” stuff. And by Woodward Canyon, I actually meant Blackwood Canyon haha. Definitely check this guy out if you haven’t heard of his wines yet. He has a Chardonnay that he only releases after spending 10 YEARS on the lees. Absolutely not. Merlot is a grape I hold in high esteem. I didn’t think so. Most folks who start a wine blog (and especially a good one) have tasted enough to be open-minded towards all the lovely little grapes of the world (verdict still out on Muscadine and other “vitis rotundifolia”). I felt obligated to pry because I sadly still see (how’s that for alliteration?) too many Merlot haters out there. Thanks for the response and no intent to call anyone out!